Today, the team at JobLogic met Gas Safe super hero Doug outside the Bullring in Birmingham. We just missed the man himself as he was probably out attending to a Gas Safety emergency somewhere in the UK, or Birmingham, which was found to be one of the most unsafe cities in the UK. On hand were Gas Safe registered engineers who gave valuable advice to gas consumers about staying Gas Safe. This included making sure the engineer that turns up to fix your appliance is actually qualified to carry out the work you require and that carbon monoxide alarms are fitted at an appropriate distance from every gas appliance. 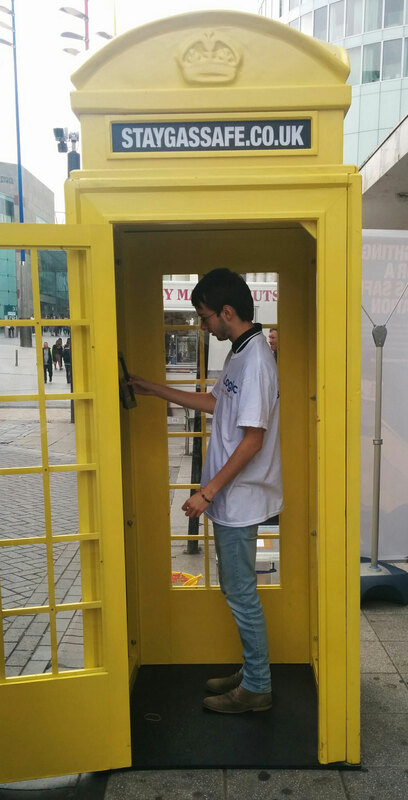 Doug is a regular guy just like us and uses a yellow phone box to change before flying off to save lives. Inside his phone box, there was a tablet where you could input your postcode to see how safe/ unsafe it is. Check out the event in your local area and don’t forget to follow Doug on Twitter. This entry was posted in Uncategorized on September 17, 2014 by theob.